Wicked is one of longest running show in West End theatre history. Is it also one of the best? 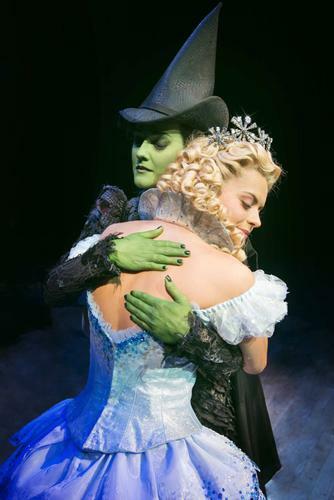 Wicked is the story of a friendship between two girls, Galinda and Elphaba, coming from very different social background. Galinda is “the good witch”, while Elphaba is the “the 'Wicked Witch of the West'. But is this the truth? The reason why I have been waited so long to see Wicked is because I never saw the movie “The wizard of Oz” (I know, I am probably the only one in the world) and this put somehow off. And I was right, because I think you can fully understand Wicked if you have a knowledge of the story. Wicked is pure fantasy entertainment. Nothing less, nothing more. There are no moral messages, or psychological twists. Even the humour is very limited. But it is a massive and spectacular production with beautiful staging, costumes, lighting and voices. Did all that transport me into the world of Oz? No, it did not. I thought the story was a bit convoluted and I never felt connected to it. The second act was weaker than the first and too long. The songs were nice, but I hardly can find one I will like to remember. Still, there is no doubt that Wicked is a huge commercial production that is entertaining so many people since 2006, filling with sold outs one of the biggest theatre of London, and it will keep doing it for many years.